Health and Care of Kishu Kens is robust and low maintenance. The Kishu Ken is a very healthy breed with few genetic health issues. It is still a primitive breed that has not been over bred, thereby creating health problems. Only two known health issues have been found in the Kishu Ken. One is low thyroid, which is not uncommon in Japanese breeds and likely has some relation to the breed’s original diet in their native Japan. It requires a daily thyroid pill. A small number of Kishu Kens will have this problem. The second known health issue is Entropion, which is genetic. Entropion is an eye problem in which the eye lid turns inward, and the lashes scratch the eye ball. It has to do with the triangular shape of the eye in Japanese breeds and it requires surgery. Because both Low Thyroid and Entropion in dogs may not be evident or present symptoms until a puppy is eight or nine months old there really are no “up front” tests that can be done. There is no test for an Entropion gene. The best thing to do is know you have a responsible breeder that will stand behind her puppies. Always ask for references from your breeder. “Hi Mom …. What’s for lunch?” Kishus are very food motivated. The Kishu Ken is highly intelligent which makes them easy to train. The breed is extremely clean and is among the easiest of all breeds to housebreak. They are faithful, loyal and loving to their family, but often aloof with strangers until they get to know them better. The Kishu Ken is a territorial dog and often dominant with regard to other dogs. 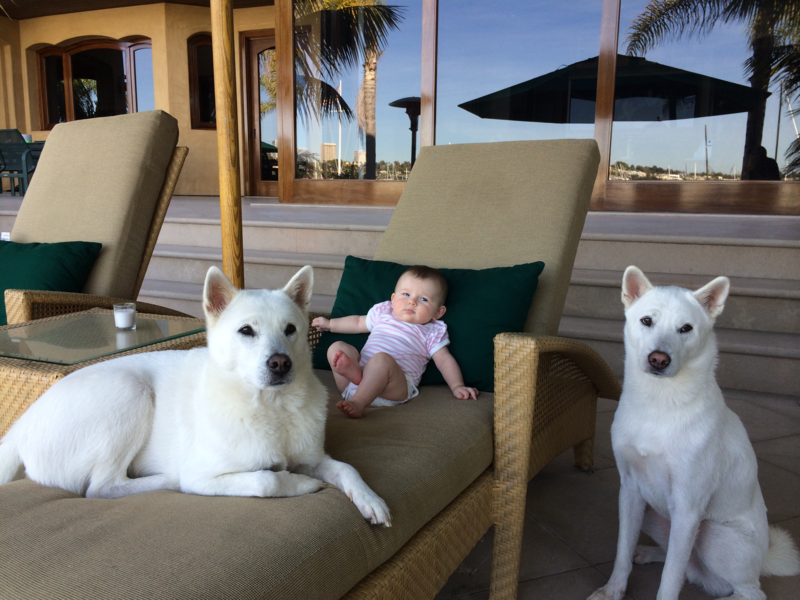 It is very important to train and socialize them around other dogs at a very early age. They get along well with cats if raised with cats. The breed is highly intelligent, and without proper training the Kishu Ken may well train its owners! Group dog training classes with an experienced, professional dog trainer are a great way to train your puppy. This type of training allows your puppy or dog to “socialize” with other dogs as well as learn commands. The Kishu Ken is an easy care dog. They do require exercise and prefer a yard to run in, but they do not do well living exclusively outside. They are social animals that need to be with the family “pack”. 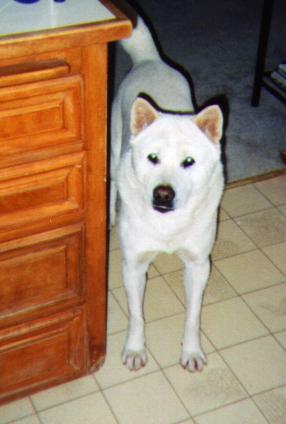 Kishu Kens do not do well in apartment homes unless active owners take them out for walks or runs every day. They enjoy hiking or just walking and then they are content to stay in and watch TV or just relax with the family. The Kishu Ken has been described as a “wash and wear” dog. They require very little grooming effort. A good brushing a couple of times a week and the occasional bath is all that is necessary, barring unusual circumstances, such as those seen here. The breed does have a double coat … a harsh outer coat and a soft downy undercoat … which means they will shed their undercoat seasonally. It can look as if it snowed when a Kishu Ken is shedding. 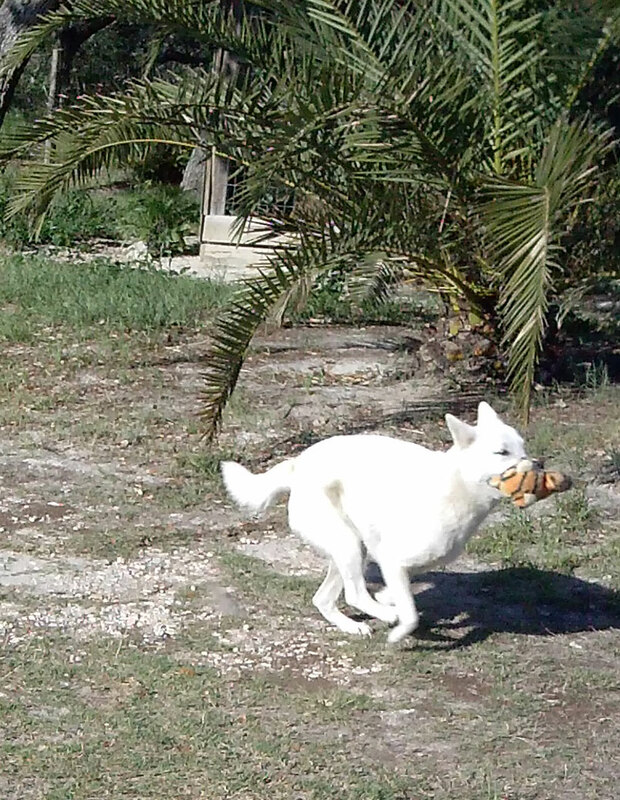 Kishu Ken “Kichi” with her tiger by the tail! Kishu Kens are hunting dogs and they have the energy level for that activity. They require some daily exercise whether running in their yard or jogging with their owner. Lack of exercise can lead to unruly behavior.